As in most cases, there’s the “best”… and then theirs the rest! Ken’s is not like any Kush strain that you have ever tried. With a mouth-watering flavor of pungent pine and absolutely no after taste together with an accent of skunk aroma it makes this dank, pungent herb a superb organic medical strain. The plants rich green buds are dense, small and almost round, like sweet “balls of heaven” with just a little bit of leaf. The buds are covered with bright dark orange red hairs, that are all wrapped up in what looks like a winter wonderland of crystals. Frosty with fresh smelling resin, this breed is well balanced and complete with the heritage and class that distinguish a great strain from a good one. 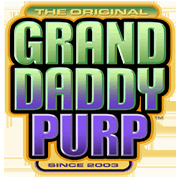 There is nothing like first-hand experience to help establish a successful company and for Ken Estes, founder of Grand Daddy Purp Genetics, this is the case. A medical patient himself, Estes acknowledges the need for superior strains that produce a genuine relief from pain. Ken Estes's commitment as a modern day "Medicine Man" has unquestionably surpassed even his own expectations. He has fought the good fight for the right to offer his patients a "smart alternative solution" for a healthier lifestyle. For 2 decades, Estes has been supporting the legal use of Medical Marijuana and is now cultivating some of the best Medical Marijuana strains available anywhere in the world with Grand Daddy Purp. Estes is truly a legend in the cannabis industry and his fantastic strains are all available at Seedsman, with the promise of offering true medicinal value to one and all. The breeders Superior Strains collection include some true classic hybrids including Blue Dream, Bubba Kush, AK-47, Headband, Kush, Silver Haze and many more.